Thanks to JOANN for sponsoring today’s post. We hope you’ve been inspired! As always, all opinions are our own. Chilly fall evenings are on their way so it’s time to start thinking about fall mantel decorating ideas. 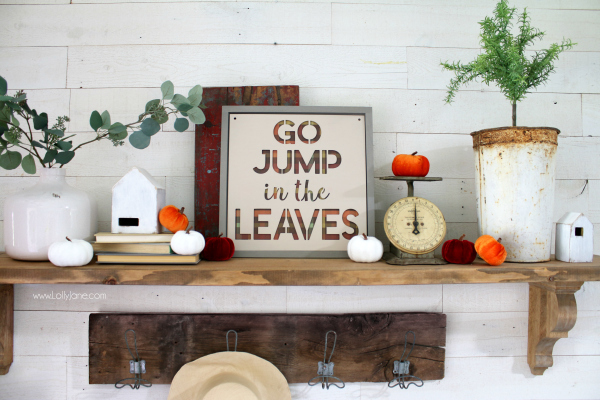 We’ve got you covered with an easy-to-make fall wood sign and layers of pretty velvet pumpkins. We’re excited to be on the JOANN team again this year! 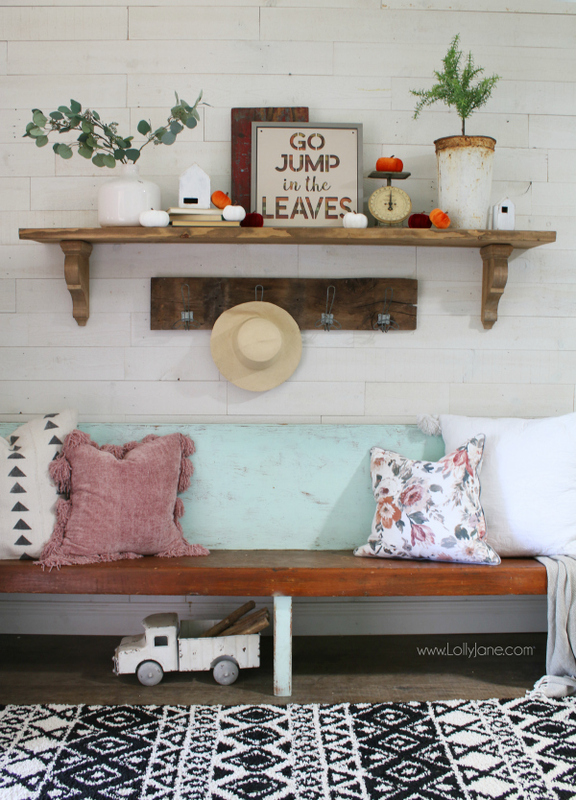 Their store is so inspiring, perfect for the diy’er inside of all of us! They have the trendiest seasonal decor, all the fabrics and loads of craft supplies you never knew you needed! 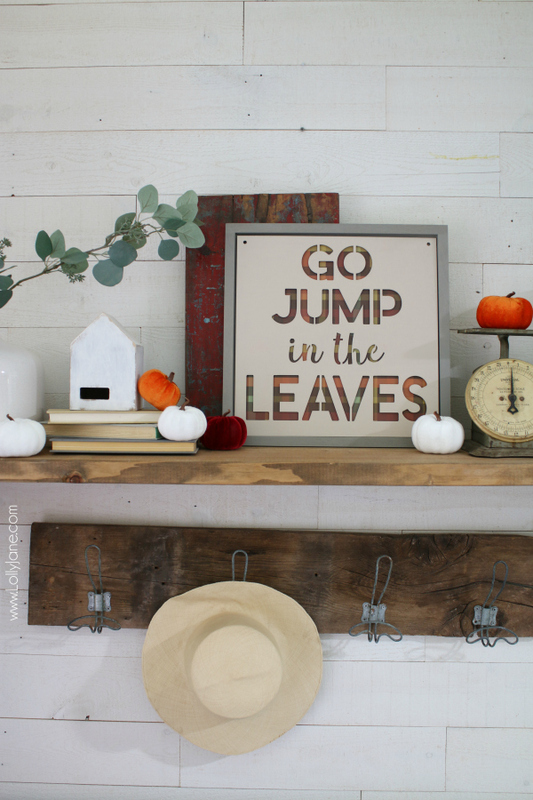 We shared a couple versions of fall mantel ideas last year using their goodies and are happy to share with you how we created a simple fall mantel using a pre-made sign and handful of velvet pumpkins. The rest of the mantel was created by shopping items my home, using a lot of white pieces and faux greenery. 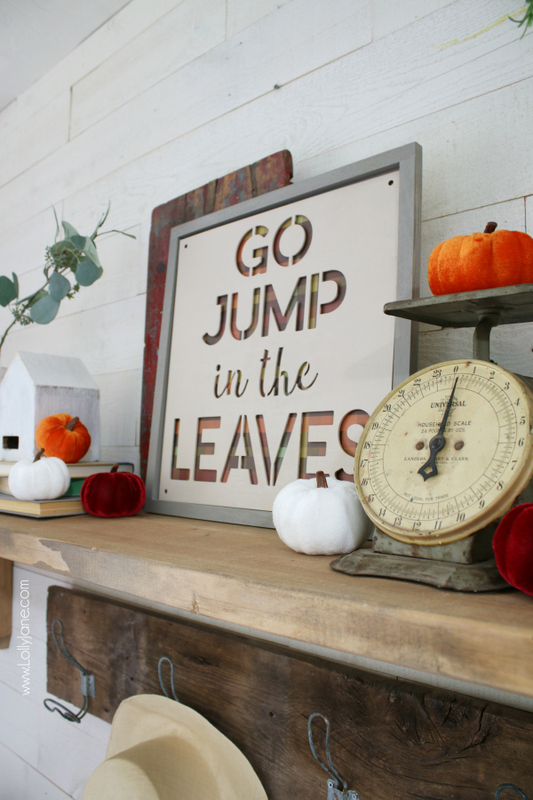 What’s your favorite part of this year’s fall mantel decorations? If you’ve been searching for fall mantel ideas on Pinterest and are wanting to copy them, we’re here to show you how! 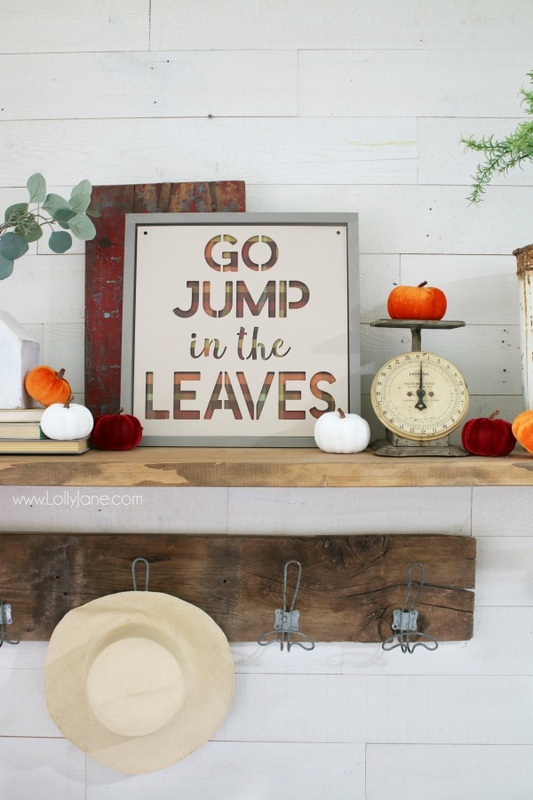 We love all fall decorating ideas, fall porches and fall signs and fall mantels and fall dessert and fall anything! Fall is such a happy month with no expectations of gift giving, just family time and food and cozy sweaters, what’s not to love! To create your own fall mantel, start with a base, a focus piece. 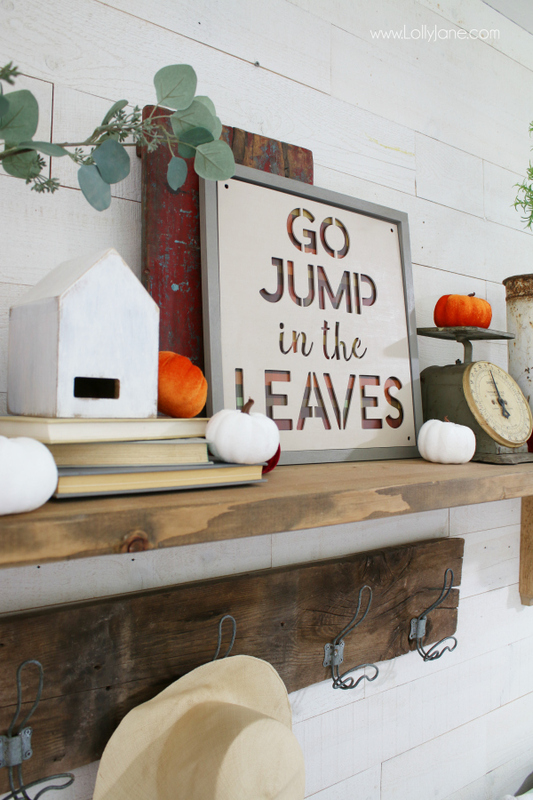 For this mantel, we used this diy fall sign to create a muted fall color scheme. We loved the plaid paper that came with the laser cut stencil so we decided to keep it for added color. 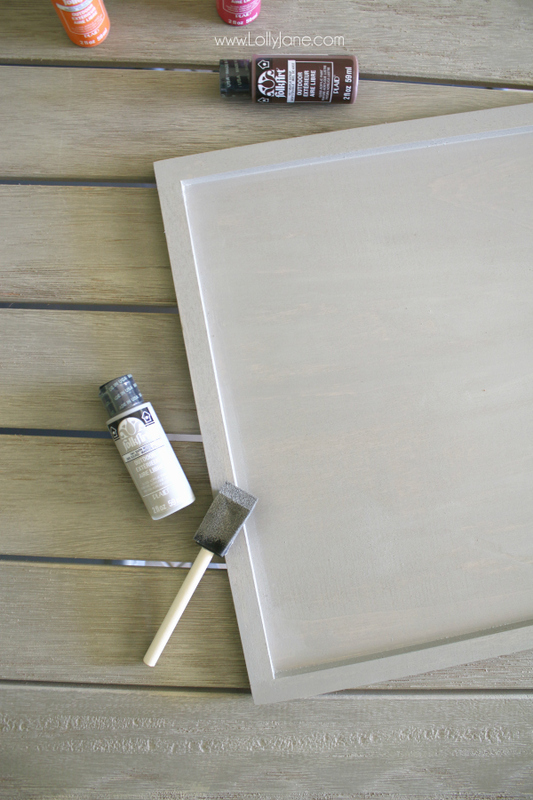 We kept the rest of the sign neutral; gray paint for the frame and cream for the stencil. We added an antique red tray behind the sign to pull out the cranberry from the paper. 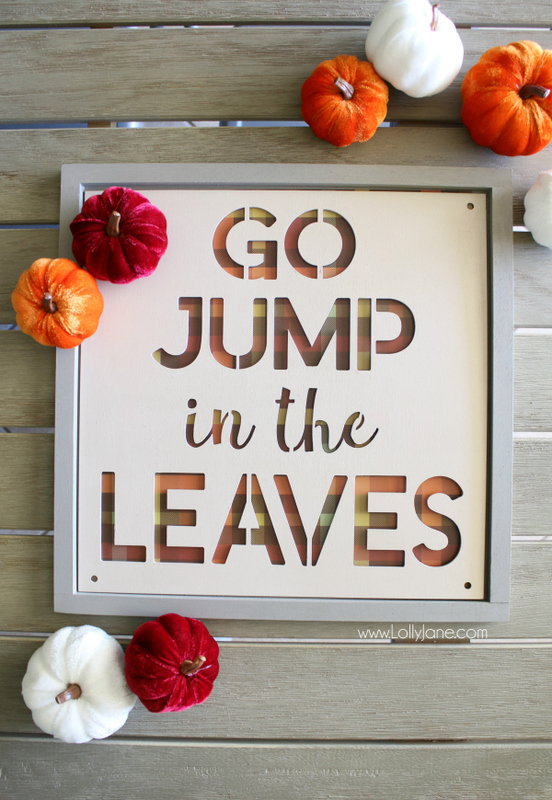 When we’re creating new seasonal signs for our shop, we often browse popular fall signs and sayings. We’re always looking for family related signs that will bring memories back to people or create memories. 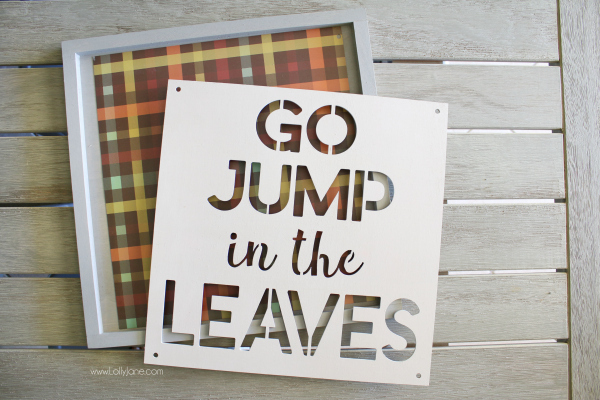 When we spotted this Go Jump in the Leaves sign at JOANN, we loved it! We grew up on a mini farm and one of our jobs every week was to rake up thousands of leaves that fell from our 50 foot trees. We loved to rake them and bury each other in them then rake them again; repeat, repeat, repeat. 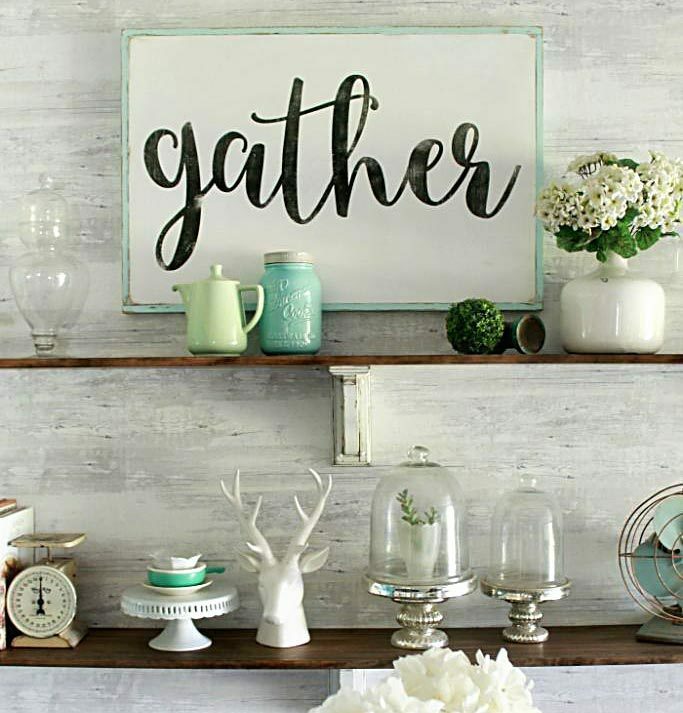 We love this sign and we love that it’s easy to make using a pre-made frame and laser stencil. 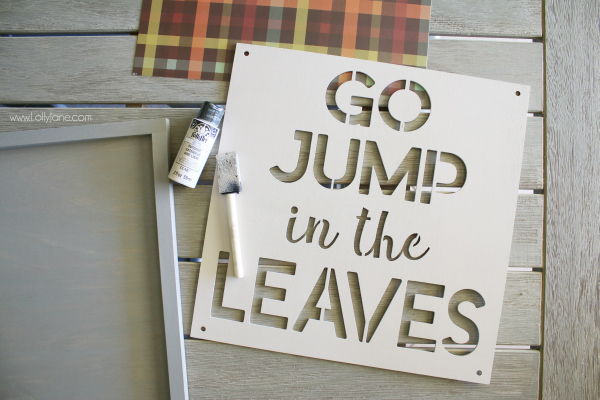 Because we used the paper that came with it, it required even less work—our kind of easy-to-make fall sign! 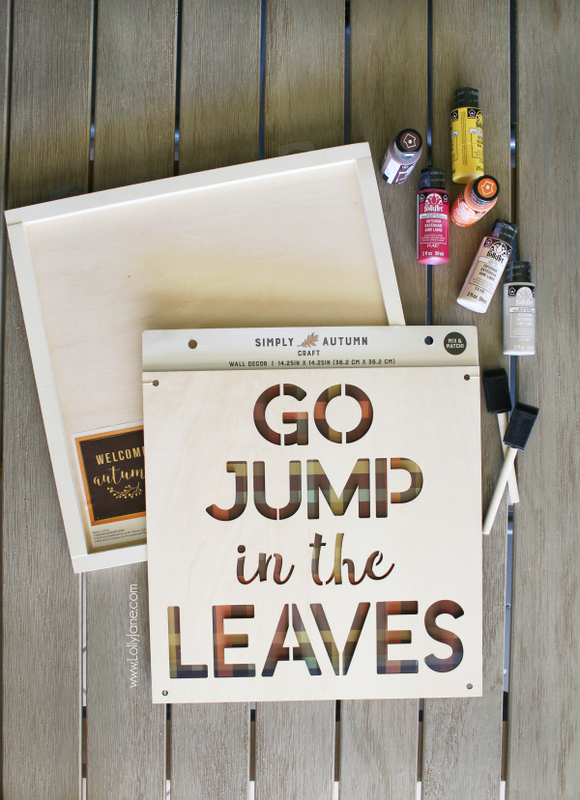 Paint the Go Jump in the Leaves stencil cream. Layer the paper between the wood pieces. Tape down behind so it’s not seen. That’s all there is to it! Grab that bag of velvet pumpkins to start layering your mantel and you’ve just created some easy fall decor! What is your plan to welcome fall this season? Are you adding a wreath to your front door and calling it good or are you going all out? We’re somewhere in the middle but do love to cozy up our entryway to greet guests. Here’s to a memory making fall!